There is nothing quite as serendipitous as creating a fresh new monthly spread. 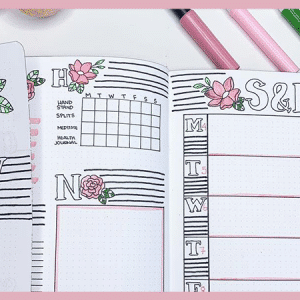 These are my top monthly pages for staying on track with your goals and creating a more organized life. There’s something about setting up a new month in your bullet journal. It’s just like om! 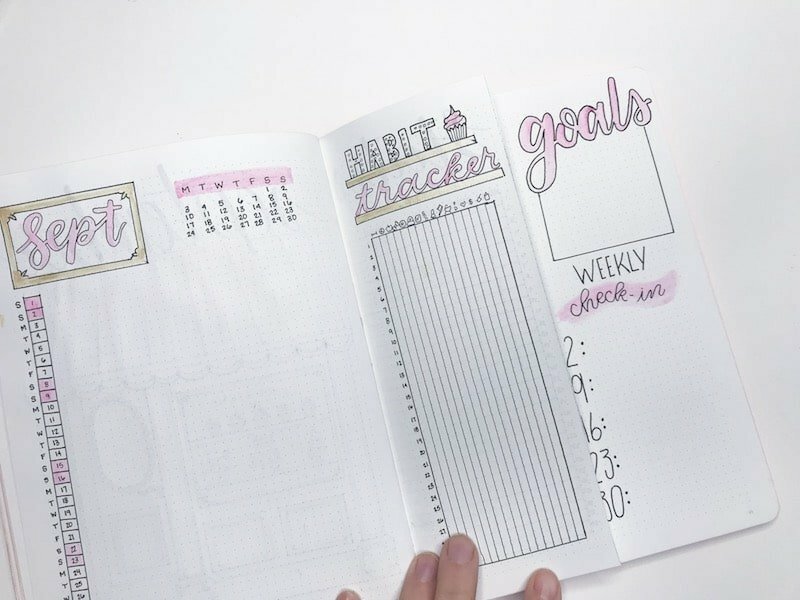 I love the crisp, clean pages and the burning motivation that happens when you start creating your habit tracker and writing down your goals. For me, there isn’t much else like it. It’s been a long time since I shared one of my monthly setups on my blog. About six months ago I decided to start doing Plan With Me videos on YouTube. And about that same time, I quit posting my monthlies here. 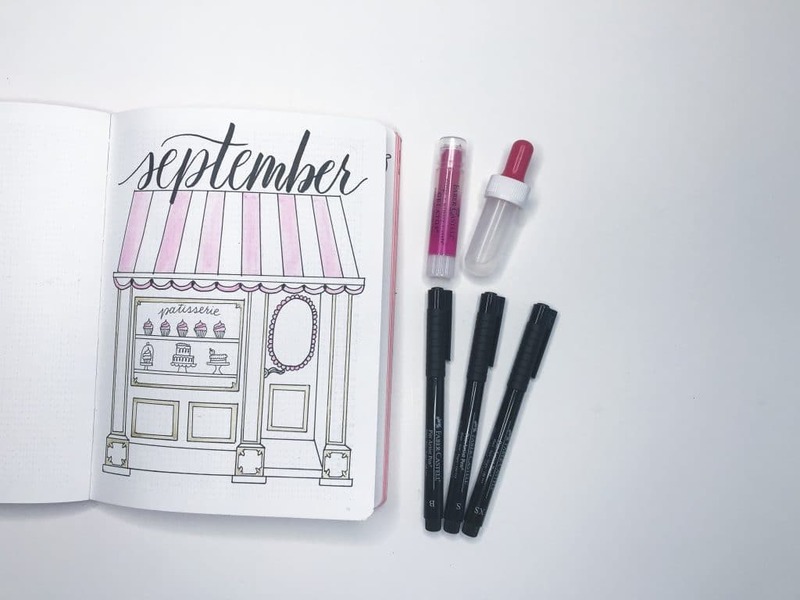 But, since it’s been so long, I wanted to share my September bullet journal setup and my top monthly pages that keep me on track and organized. If you would prefer to watch the video, you can do so here! 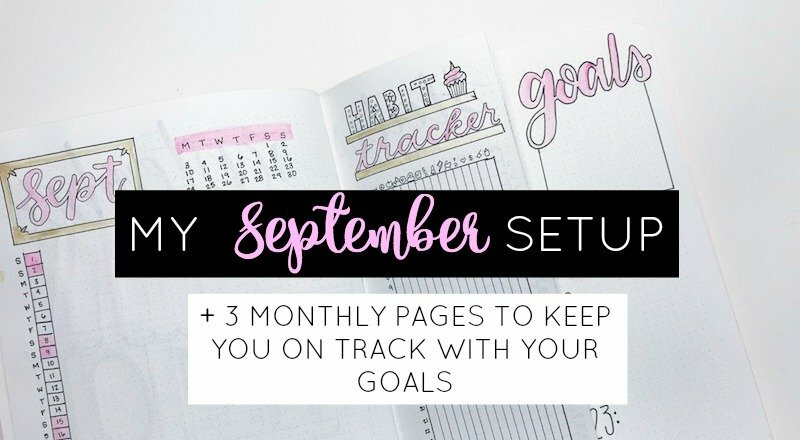 But, in all honesty, I’m a bit of a rambler and this post will likely give you better insight into how I use the pages in my September setup. I was at a complete loss on what theme I wanted to do for September. I have a post with tons and tons of theme ideas, and yet I had no clue what to do. It wasn’t until about 15 minutes before starting my September setup that I figured it out. I get asked all the time, how do you choose your theme, or where did you get that idea? Truth be told, I’m a Pinterest-aholic and I use it for everything. 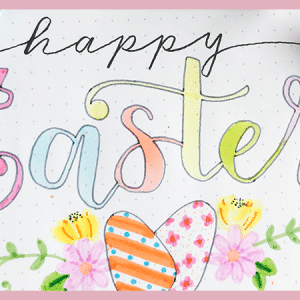 I use it for our dinner menu, blogging and social media tutorials, and of course, bullet journal inspiration. This month’s cover page is heavily inspired by a piece of artwork by Melissa Colson. I found an image of her print, Les Petits Gâteaux Bakery, which you can see and order prints of, here. And once I saw that picture, I knew that I wanted to go with a very feminine bakery/baking theme. I love cupcakes. I love donuts and cake. It seems fitting. For the first time ever, I tried a dutch door monthly spread in August. And I fell in love with how open and viewable everything was. All of my important events, trackers, and goals were in one place. So, I decided to stick with the same dutch door setup for this month. On the righthand page, I set up a vertical calendar that would be viewable even when the smaller center page was folded over. On the center folding page, I drew my habit tracker. And on the page behind the small center page I placed my goals. Again so they are viewable alongside the dutch door. 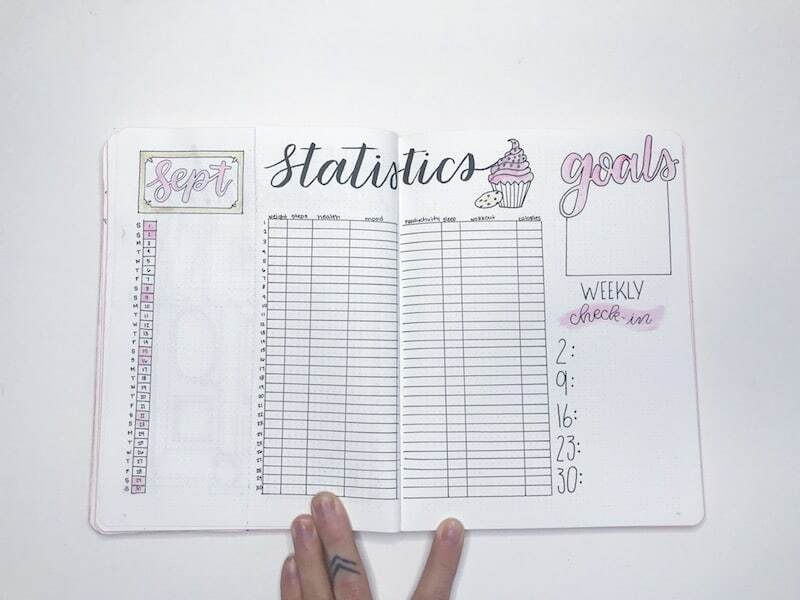 On the inside of the dutch door and along the righthand side of the lefthand page (I know it sounds confusing, but it’s not) I placed my monthly statistics tracker. Want to learn more about dutch door setups? I have a post on weekly dutch door setups as well as a YouTube video showing how I cut and create my dutch door weekly pages. *I must clarify that I received these items for free from Faber-Castell. You guys know me… I’m not about to lie for anyone. Opinions are my own. — the old version of the Nuuna. There was a little bit of bleeding, but it was likely due to my lack of watercolor skills. After I started in my new Nuuna, I gave up on the idea of using watercolor in my journal. The pages in the newer Nuunas are not nearly as durable, and even Tombow Dual Brush pens bleed through on occasion. So, there was no way I was going to risk a big watercolor fiasco.
. Now, I have seen these Gelatos as Michael’s before, but I honestly always thought they looked like a mix between a crayon and a tube of chapstick; and I had no idea what the heck they were for. I wanted to give them a chance, so I said, what the hell, and put them to to the test for my September setup. Every once in a while, I take risks and am pleasantly surprised by the results. That’s exactly what happened with these. They were easy to mix, laid down beautifully, and created the perfect soft shades I was looking for. previous to Faber-Castell sending me a few packs. The first time around I was impressed for about a month. But I felt that they ran out of ink much faster than other brands. I can’t yet say if the same will happen with these as I have only been using them for about a week now. But, the good news is that the quality of the ink is up to par. I love the variety of sizes and the deepness of the black ink. I haven’t had any issues with bleeding, ghosting, or feathering in my Nuuna, Rhodia, or Baron-Fig notebooks. , and I love it. Like, I think I like using it more than my Tombow Fude Pens, and that says a lot. 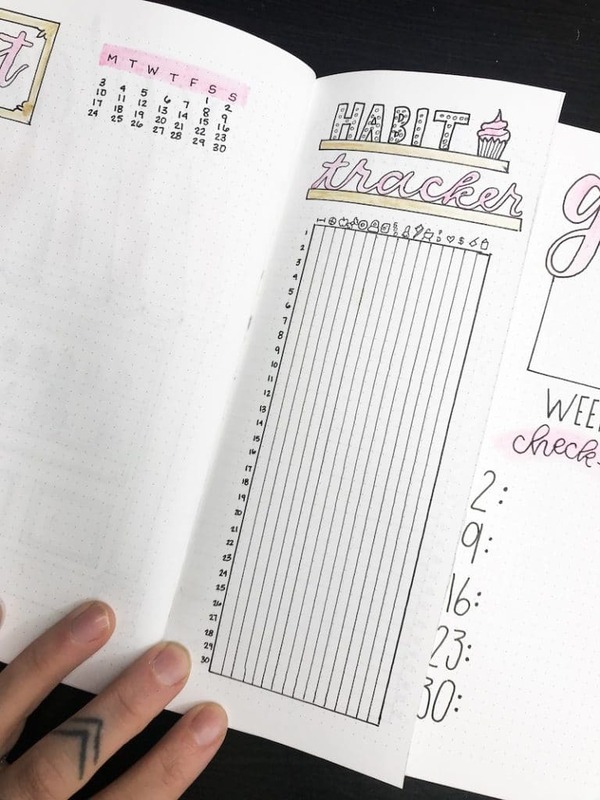 When I very first started bullet journaling, I stuck to the basics: a calendar and a habit tracker. As time went out, I added more and more pages. Gratitude logs, mood trackers, daily affirmations, etc. It got to a point where filling in my journal took an hour to an hour and a half a day. For some people, this many pages and daily workload may be totally okay. For me, it became tedious and more like a chore. And eventually, I ended up skipping days completely the task of filling in my trackers was too overwhelming. In other words, my journal became pointless. So, I reanalyzed my priorities and goals and decided to kick it back a notch. I got rid of a lot of pages that didn’t serve me or my goals. Afterall, it is my journal and the greatest part about it is that I can tailor it to my needs. So here are the pages I have now, and the ones that I find most beneficial to goal tracking and self-improvement. Mind you, these can and likely will change at some point. Take the ideas presented here with a grain of salt and if you like, tailor them to fit and work with your life and your goals. No one is or should be telling you what pages you must have in your bullet journal. The good ol’ habit tracker. 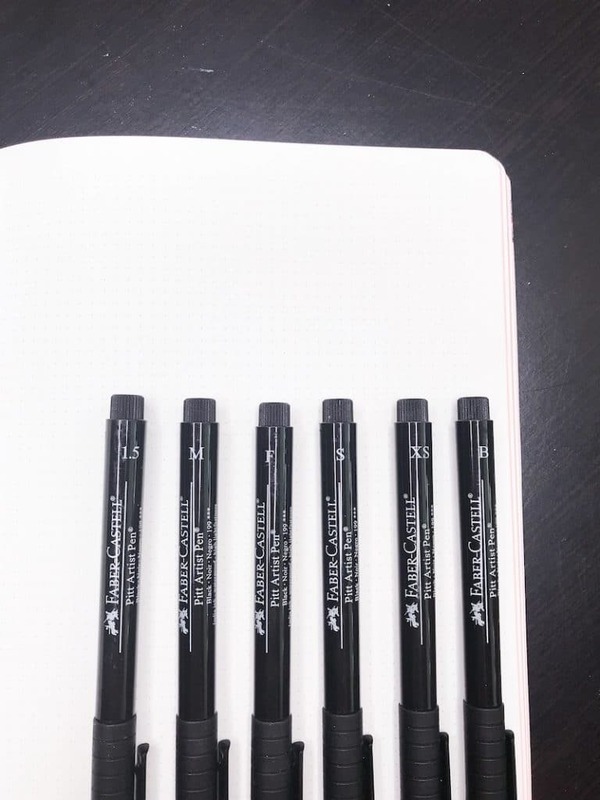 It’s likely the single most well-known page of bullet journal. Almost everyone uses or has used one. I love my habit tracker because it allows me to keep track of the things that matter most to me. And everyone’s is different. You can literally keep track of ANYTHING with a single row of checkboxes. Focusing on drinking more water? Put it in your habit tracker. Want to practice doodling each day and hold yourself accountable? Put it in your habit tracker. Want to spend less than $5 a day? Put it in your habit tracker. My habit tracker stays pretty consistent but may have minor changes depending on the month and what my goals are. But some things always remain. 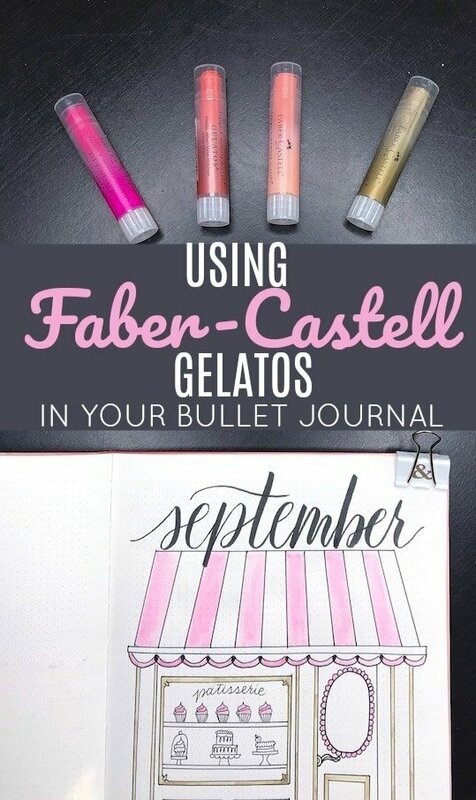 Since starting my bullet journal, I have always had a workout item and some form of a nutritional tracker, because these are things that are very important in my life. But, here and there I have life events that come up, which are temporary, and I want to track them for a month or two only. An example of this is when I was creating my flagship E-Course, Rock Your Journal, and I wanted to track the days that I sat down to work solely on that project. Or, during the summer months, I might have a tracker for running… as I’m not bold enough to run in the cold. Aye, I’m a poet! So, the habit tracker is here to stay. Forever and for always. It may change shape and appearance, but its functionality and accountability will always stay the same. I started this page in August and was absolutely astonished that I hadn’t done it previously. Previously, I had always included a goals section in my monthly setup. I like to break my big goals down into smaller, simpler goals. So annual goals get broken down into monthly goals, monthly goals get broken down into weekly goals, and then my weekly goals are broken down into small daily actions. But, the new part that is so crucial and effective is the weekly check-in. For me, these check-ins fall on Sunday. Because my week starts on Monday, I like to evaluate my situation and then plan my week accordingly. This has really helped me be more honest and open about the progress I’m making towards my goals. This page is very similar to the habit tracker. But instead of marking off a box, you insert specific information. My statistics page for September includes daily: weight, steps, a rating of health, mood, productivity, hours of sleep, workout, and calories. But this spread could be made for anything you wanted more specific daily information on. You could include hours read, time spent creatively, hours of work, the number of glasses of water, etc. Now, for the reasoning behind this spread. First off, I am not a mathematical person. I’m definitely more of a creative and visual person. But, I love to look at charts of information and see relationships between certain items. For instance, if I only got 5 hours of sleep the night before, maybe my productivity and mood were down. And at 7 hours of sleep, I was seeing optimal levels of productivity and mood. So, then I can focus on getting 7 hours of sleep to make sure that the following day is productive and positive. I believe simple spread could benefit people who live with depression and anxiety as they could track the rating of their anxiety for the day as well as typical triggers. Maybe, include diet or food elimination item and a sleep tracker as well. This may help narrow down what particular events trigger anxiety or mood shifts. From there, you can work on changing your daily habits to avoid those triggers. This post turned out to be about 1000 words longer than I initially anticipated. And at the end of it all, there’s a chance that none of these pages will be right for you. But if you are looking for new ways to hold yourself accountable for your goals and stay organized on a daily basis, give these a try. Remember that your bullet journal is yours alone. No one can tell you what you have to put in it or what is going to work for you. Most of it is trial and error. I try to encourage and give you ideas that may help. But, it’s up to you to decide if they belong inside the pages of your journal.